I'm building the Welztalbahn layout for about 4 years now. Spring 2009: Hidden staging level and ramp to middle level are built. Also, I'm already toying with computer control. Spring 2010: Track on the middle level is almost complete. First scenery ("the creek") is in. Spring 2011: The main line is functional through all 3 levels. Most tracks are in. There's scenery, even some background. 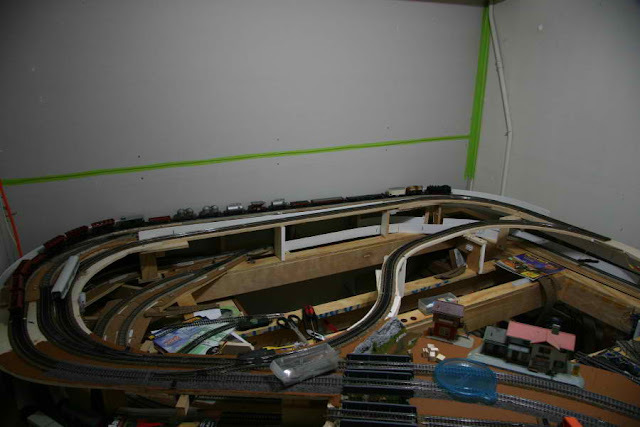 Spring 2012: More scenery, signals, and a tested operating scheme.